Posts categorized "▪ Just Compensation | Appraisal"
We obviously wish we had better news, but today, the U.S. Supreme Court in this order declined to review the Mississippi Supreme Court's decision in a just compensation case in which we represented the petitioner. When a State negotiates an easement limited to one purpose but later uses the land for an entirely different purpose, can the State limit, by operation of statute, the compensation it must pay for that new taking? The Mississippi Supreme Court held that it may do just that. But this decision seems difficult to square with the teachings of this Court’s cases holding that legislatures generally cannot limit the compensation due under the Takings Clause of the Constitution. See Monongahela Navi. Co. v. United States, 148 U. S. 312, 327 (1893). Tension appears to exist, too, between the decision here and decisions of the Federal Circuit. See, e.g., Toews v. United States, 376 F. 3d 1371, 1376 (2004). And the matter is one of general importance as well, for many states have adopted statutes like Mississippi’s and the question presented implicates a fundamental feature of the compact between citizen and State. Given all this, these are questions the Court ought take up at its next opportunity. In other words, a good issue here (we even wrote the Question Presented in the next case for you), there's a lower court split, and this is a matter of "general importance." Just not in this case. Why, they don't say. SCOTUSblog Notes Bay Point Just Comp Case As "Petition To Watch"
SCOTUSblog takes note of our cert petition in Bay Point Properties, Inc. v. Mississippi Transportation Commission, No. 16-1077 (cert. petition filed Mar. 3, 2017), a case which seeks U.S. Supreme Court review of a decision by the Mississippi Supreme Court. We represent the Petitioner. So let’s see what new grants may be in the offing for next Monday. The biggest of this week’s four new relists, at least as a doctrinal matter, is probably the one involving a legislature’s ability to limit how just compensation for a taking of private property is calculated. But for day-to-day importance, the one involving the whistleblower provisions of Dodd-Frank is nothing to sneeze at. All of the briefs in the case are posted here. Fifth Circuit: "the United States’s sovereign immunity can bar cases against it based on the Takings Clause"
In Sammons v. United States, No. 17-50201 (June 19, 2017), the U.S. Court of Appeals for the Fifth Circuit effectively adopted that same reasoning. In a short opinion, it held that takings claims involve "public rights," and therefore, Congress may validly assign adjudication of those rights to non-Article III courts. Like the Sixth Circuit, the Fifth Circuit panel rejected the owner's contention that the Takings Clause is self-executing, and thus Congress' consent to be sued isn't necessary. It did so without really reaching the merits of the argument: "But whatever the merits of the parties' positions, the issue is foreclosed." Slip op. at 4. The panel held that it was already circuit precedent that the Takings Clause was not a waiver of sovereign immunity, and "[i]t is well-established in this circuit that one panel of this Court may not overrule another." Slip op. at 5. Which boots the issue upstairs. So you know where this issue is headed. No sleeping under the bridges of Paris! In Ada County Highway District v. Brooke View, No. 43452 (May 23, 2017), the Idaho Supreme Court held that construction damage caused by the Highway District to property adjacent to -- but not part of -- a road project for which it took property, was not covered in the condemnation case as damage caused "by reason of ... the construction of the improvement." During construction of the highway widening project, the county damaged a wall belonging to the condemnee. Idaho Code § 7-711 (emphasis added). The court concluded that the italicized text above didn't mean that a condemnor would be liable for the damages caused by the "method" of construction, but only in the "kind of improvement" to be built. Slip op. at 8. That's a pretty fine distinction, and one we're not really sure how to unwrap. Ultimately, however, what seemed to convince the court was the nature of eminent domain actions as compared to tort claims for negligence. The point of eminent domain, according to the court, is valuation of the property on the date of the taking (in Idaho, the date of summons). Which means that injury to property incurred after the date of summons isn't included. "There are many occurrences during a construction project that could possibly injure the remaining property, depending upon the nature of the remaining property and other factors. When the summons was issued, one would not know whether the remaining property would be injured by something that may later occur during the construction process or the extent of such possible injury." Slip op. at 9. Brooke View next asserts that if just compensation does not include the damage to the Wall, it would be inequitably left without legal recourse because it would be unable to prevail under a tort theory. This Court takes no position as to whether Brooke View might be able to recover in a tort action. To make such a determination would be improper, especially considering that the district court specifically forbade the parties from presenting evidence that would be relevant in a negligence case. However, whether Brooke View could prevail under a tort theory does not dictate whether limiting Brooke View to tort theories is equitable or inequitable. To the contrary, our interpretation of Idaho Code section 7-711 leaves Brooke View in exactly the same position as any other party whose property is damaged during a road improvement project. Yes, but it sounded better in the original French: "Ils y doivent travailler devant la majestueuse égalité des lois, qui interdit au riche comme au pauvre de coucher sous les ponts, de mendier dans les rues et de voler du pain" (the law, in its imperial majesty, prohibits the rich and the poor equally from sleeping under bridges, begging in the streets, and stealing bread). Property owners who had their land seized and damaged should be in no better position that the other poor saps whose property was merely damaged: "The fact that neighbor A had a small part of property taken should not separate her from neighbor B when it comes to bringing claims for the same damage caused the same way." Id. The links to the cases and materials we mentioned in the talk are posted here. My thanks to Bart Freedman (K&L Gates) and Kinnon Williams (Inslee Best Doezie & Ryder) for asking me to speak on national takings and inverse condemnation issues at yesterday's Eminent Domain conference in Seattle. As you can see, the room was packed and standing room only. Here are the cases and issues I mentioned during my talk, "National Takings Trends, Hot Practice Areas, and Property Rights in the Age of Trump:"
Pipelines and energy transmission corridors: Pennsylvania Supreme Court on public use. Pennsylvania appeals court on public use and the polar vortex. Pipelines and energy corridors II: Through Kentucky and "public" use. Flooding cases - a hot topic. Lessons for eminent domain pretext from the Immigration EO case. Municipal utility takeovers: public ownership on Montana water company is "more necessary." Project announcement: North Carolina's Map Act, Nevada Supreme Court, California Court of Appeal. Sharing economy: Seventh Circuit (Posner) on Uber vs taxis. Georgia Supreme Court's recent opinion on sharing economy takings. Uniform Relocation Act and inverse condemnation attorneys' fees. South Carolina: attorneys' fees as "property." Cases to watch II: Violet Port Dock - Louisiana Supreme Court considering public use. Cases to Watch II: Murr v. Wisconsin - the larger parcel in regulatory takings. Here's a rundown of the commentary on Bay Point Properties, Inc. v. Mississippi Transportation Commission, No. 16-1077 (cert. petition filed Mar. 3, 2017), a case which seeks review of a decision by the Mississippi Supreme Court. We represent the petitioner. Cato Institute Legal Briefs: Bay Point Properties v. Mississippi Transportation Commission: "Unfortunately, governments often do everything they can to get around the Fifth Amendment’s requirements, as the Mississippi Transportation Commission did when it tried to redefine the nature of Bay Point Properties’ land so as to make it effectively valueless for just compensation purposes." Pacific Legal Foundation Liberty Blog - State legislatures do not define what constitutes "just compensation": "The Just Compensation Clause protects against this type of abuse, but courts must make sure not to defer to legislature’s calculations of just compensation. Hopefully the Supreme Court will review Bay Point’s case in order to reaffirm that the power of eminent domain is not unlimited, and to ensure the proper constitutional protections for all property owners." NFIB blog - The Latest in the Fight Against Eminent Domain Abuse: "Accordingly, we’ve joined in calling upon the U.S. Supreme Court to take this case, to make clear that state government’s may not evade their obligation to pay fair market value. Under no circumstance may a State take property and short-change the owner simply by passing a statute dictating to courts what should be deemed 'just compensation.'" Federal Takings blog - "Applied here, the right to trial by jury “means the jury, not the Mississippi legislature or Highway Commission, determines the value of that property Mississippi took from Bay Point. " Amici Brief of Cato Institute, the NFIB Small Business Legal Center, Reason Foundation, Southwest Legal Foundation, NARPO (the National Association of Reversionary Property Owners), the Property Rights Foundation of America, and Professor James Ely (property and easement expert), Shelley Ross Saxer (land use and takings), and Ilya Somin (eminent domain, among other subjects). Yesterday, the Hawaii Supreme Court issued a unanimous opinion opinion authored by Justice Nakayama in an eminent domain case we've been following. We filed an amicus brief in the case supporting the property owner on one of the three issues presented, too. More on that below. The case involves three parcels on Kauai -- one of which is owned by a fellow who has been a thorn in the County's side -- which were condemned by the County for the expansion of a public beach park. The County was taking Parcels 49, 33, and 34. Sheehan owned 49, and HRH, an entity incorporated in the Cook Islands, owned 33 and 34. Sheehan asserted his use of Parcel 49 stretched across 33, 34, and Area 51 -- a portion of another Parcel but not a separate record lot. He claimed to use Area 51 pursuant to an easement. The owner sought damage for the severance of Parcel 49 from Area 51. He also challenged the "blight of summons" damages (also known inaccurately as "interest") on the final just compensation award. There was also a dispute after the County revised its appraisal downward, and then withdrew a portion of the deposit which it had made to secure immediate possession. The court of appeals held that Hawaii law requires that two parcels physically abut before a jury can consider them part of a larger parcel. The property owned by the condemnee was separated from the other parcel he claimed to use, and not physically connected. The condemnee claimed he used the two parcels together as a boat yard, and therefore the taking of his property damaged his use of the other. Applying the "three unities" test, the ICA held that the owner "cannot satisfy the physical unity requirement” because the two parcels Petitioners claim to use together are separated by two others. County of Kauai v. Hanalei River Holdings, Ltd., No. CAAP-14-0000828, slip op. at 31; 2016 Haw. App. LEXIS 224, at *10 (2016). The ICA asserted the "must touch" test was established by the Hawaii Supreme Court in City and County of Honolulu v. Bonded Investment Co., Ltd., 54 Haw. 523, 511 P.2d 163 (1973), which, in the ICA's view, required "that all of the pertinent lots abut one another." Slip op. at 20. "Must two parcels physically abut in order for the jury to consider whether they are part of a larger parcel?" The second question challenged how the courts below calculated blight of summons damages, and whether the County had conditioned its okay of the owner's withdrawal of the deposit which the County had made to secure immediate possession. The final question was whether the County could reduce the deposit after it updated its appraisal of the property, and it lowered its valuation. The County opposed the application. The Supreme Court heard arguments earlier this year, and yesterday issued a very readable 50-page opinion. The short story is that it corrected the Court of Appeals' larger parcel analysis, holding that parcels didn't need to physically abut in order to be part of the severance damage claim. This was the argument we advanced in our amicus brief, so we're glad the Supreme Court agreed. But the court didn't disturb the judgment, and held that even under the correct analysis, the owner didn't prove any of the three unities. Accordingly, we hold that when determining whether a claimant is entitled to severance damages under the three unities test as articulated in Bonded Inv. II, the three unities should be evaluated and weighed against one another as factors, and should not be viewed as essential elements. The unity of use should be accorded more weight compared to the unity of title and physical unity. Consequently, a lack of physical unity will not be dispositive of a condemnee's claim for severance damages. Therefore, the ICA gravely erred to the extent that it applied the three unities as elements and barred Sheehan from claiming severance damages as a matter of law because Parcels 49 and Area 51 are not physically contiguous. Slip op. at 26. Check it out, the court has a good summary of the law nationwide in this part of the opinion. As to the second and third issues, the court affirmed the court of appeals' rulings on conditional deposit, and the condemnor's ability to withdraw a portion of the deposit to reflect its lowered appraisal. The Supreme Court concluded that the condemnor was not placing a condition on the owner's withdrawal of the deposit when it required the owner show it was entitled to compensation. This seems like a reasonable demand, and one which comes from the language of the statute: the withdrawing party has to show that it is an owner "entitled to compensation" before it can withdraw. We therefore hold that a deposit made unconditionally at the outset may later become conditional if, after the initial unconditional deposit, the condemning authority opposes the withdrawal of the deposit to an entitled condemnee by imposing a subsequent condition upon the withdrawal of the funds. Accordingly, we agree with the ICA and hold that the court in an eminent domain proceeding has the discretion to permit a governmental entity to withdraw a portion of a deposit of estimated just compensation when the deposit has not be disbursed to the landowner, the government acted in good faith in seeking to adjust the estimate to accurately reflect the value of the property on the date of summons, and the adjustment will not impair the substantial rights of any party in interest. All in all, an interesting end to an interesting case. Here's the Reply Brief we're filing today in Bay Point Properties, Inc. v. Mississippi Transportation Commission, No. 16-1077 (cert. petition filed Mar. 3, 2017), a case which seeks review of a decision by the Mississippi Supreme Court. We represent the petitioner. The court below invited legislatures to convert highway easements into parks, road easements into subways, and utility easements into stadiums, without justly compensating property owners. In Respondents’ view, the jury had to pretend Petitioner’s land was encumbered by the very highway easement the jury had already determined was not being used for a highway purpose; justly compensating Petitioner would represent “a windfall.” BIO 10. Their argumentative excess demonstrates exactly what went wrong below: the court required the jury to ignore reality, and allowed a statute to override the Just Compensation imperative. This Court should not do the same. Statutory abandonment cannot govern just compensation guaranteed by the Fifth Amendment. The remedy sought here is revealing: Petitioner didn't seek ejectment—merely compensation for the taking. This distinction is critical. Mississippi's statute may allow Respondents to remain on the land because they have not formally abandoned their limited-use highway easement, despite converting it to an admittedly different, non-highway use and discontinuing the Toll Project No. 1 bridge. The Just Compensation Clause—not Mississippi’s abandonment statute— controls, however, and requires full compensation once Respondents did so. Respondents concede they were only authorized to use Petitioner’s property according to Toll Project No. 1’s “plans and specifications.” App. 3. They also acknowledge “a portion of the highway easement used for the bridge landing was converted into a park and parking lot.” BIO 1. They concede the jury found these new uses were not highway purposes, and that the jury concluded Respondents took Petitioner’s property. BIO 3. Yet, they argue, “the continued use of the easement by Respondents for a public purpose does not equate to abandonment,” meaning that compensation was measured as if the land continued to be subject to a highway use, even though it was not. BIO 2. This circumvents the issue, because just compensation isn’t limited by abandonment under section 65-1-123, but is measured by what was actually taken—Petitioner’s right to use its property, unencumbered by anything but Toll Project No. 1. Respondents have no answer, except to assert Petitioner did not raise and the courts below did not pass upon, this claim. Their objection fails to withstand even modest scrutiny. Petitioner raised the claim on the first page of its brief below, and the court considered it. See App. 15. Respondents alternatively assert the constitutional claim is inconsequential. They offer no reason for the Court to deny review of the important question of whether a state’s ability to supersede its common law of property also allows it to limit the amount of compensation it must pay for resulting takings. In suggesting the decision below poses no issue worthy of review, Respondents disregard the contrary view of property scholars, national public interest and property rights organizations, and property owners who have been subject to similar tactics, all of whom filed amicus briefs. As amici underscore, this case presents an important opportunity to reaffirm the principles of Monongahela Navigation Co. v. United States, 148 U.S. 312 (1892), and clarify that Mississippi may redefine its property law, but may not avoid its duty under the Just Compensation Clause to provide the full extent of what Petitioner lost when Respondents openly and notoriously put an easement which had been granted only for Toll Project No. 1 to different uses. Converting an easement for a limited highway purpose into a general servitude for an indefinite period, as Respondents unabashedly trumpet, certainly qualifies as a fully compensable taking. Twelve amici have filed three briefs in support of the petition, including a brief joined by Professor James W. Ely, Jr., co-author of the leading easement treatise, cited by the dissent. The case is on the Court's June 1, 2017 conference schedule, so we should know more the following week. Do you really need an excuse to visit Seattle? If you do, and want to earn some CLE credit while you're at it, check it out the brochure for the upcoming Eminent Domain seminar on May 18, 2017. This is a one-day program that focuses on the hot topics in our area of law. We'll be speaking about "Changes in National Public Policy" and the latest developments in eminent domain and takings law. Agenda and full registration information here. Here's the third amicus brief filed in support of our cert petition in Bay Point Properties, Inc. v. Mississippi Transportation Commission, a case asking whether the Just Compensation Clause prohibits a court from instructing an inverse condemnation jury that it must value taken property as if it was burdened by a highway easement which the jury found as a matter of fact had been abandoned. This brief was submitted by a stellar group of public interest organizations and legal scholars: Cato Institute, the NFIB Small Business Legal Center, Reason Foundation, Southwest Legal Foundation, NARPO (the National Association of Reversionary Property Owners), the Property Rights Foundation of America, and Professor James Ely (property and easement expert), Shelley Ross Saxer (land use and takings), and Ilya Somin (eminent domain, among other subjects). The brief, authored by Thor Hearne and his Federal Takings team, Cato's Ilya Shapiro, and NFIB's Luke Wake, focuses on the Supreme Court's Monongahela decision in which the Court held that Congress could not set the terms for how much compensation was due for a taking. In the Bay Point case, Mississippi adopted a statute which gives the MTC the unreviewable discretion to determine whether to officially abandon highway easements, even where the property is no longer being used in accordance with the original grant of an easement. Because the MTC had not done so, the trial court ordered the jury to value the taken reversionary interest as if it continued to be burdened by a highway easement, even though the jury found the highway was in fact abandoned. The right of jury trial in civil cases at common law is a basic and fundamental feature of our system of federal jurisprudence which is protected by the Seventh Amendment. A right so fundamental and sacred to the citizen, whether guaranteed by the Constitution or provided by statute, should be jealously guarded by the courts. Jacob, 315 U.S. at 752-53. Applied here, this means the jury, not the Mississippi legislature or Highway Commission, determines the value of that property Mississippi took from Bay Point. The Mississippi scheme compelling the jury to value that property the Highway Commission took from Bay Point assuming the land is already encumbered with the easement is contrary to the principle that the judicial, not legislative branch, determines just compensation. Mississippi’s statutory scheme, as applied here, invades and invalidates the jury’s role in deciding just compensation. Br. at 23-24 (footnote omitted). The two other amicus briefs (the brief by Pacific Legal Foundation and the brief by the Virginia Institute for Public Policy and Owners' Counsel of America) are also posted. The Brief in Opposition is due May 8, 2017. Stay tuned. New SCOTUS Just Comp Cert Petition: Can Jury Value Property As If Burdened By Extinguished Easement? Here's another amici brief (on behalf of the Virginia Institute for Public Policy, and Owners' Counsel of America, authored by takings/SCOTUS superstar Michael Berger) supporting the cert petition we filed last month which asks the U.S. Supreme Court to review a decision of the Mississippi Supreme Court. Here's the amicus brief which Pacific Legal Foundation filed earlier. This post has the background on the case and issues. 1. It is important for the Court to reassert the primacy of federal law as determining the baseline protection provided to private property owners by the 5th and 14th Amendments. Although the issue should not be at large, a number of courts — as exemplified by the Mississippi Supreme Court — are seeking to secure for themselves the right and the power to redefine property in such a way as to confiscate private property for the use of the state. 2. This Court cannot permit state courts and legislatures to poach the power to redefine and thereby confiscate private property. Fundamental precepts of this Court’s jurisprudence stand in the way. They are not called into play often, because few states have had the effrontery to seek to invade the federal prerogative, but the record below shows enough encroachment to warrant this Court’s intervention as guardian of the 5th Amendment. 3. Indeed, this Court has plainly stated the precept at the heart of this case: “[A] State, by ipse dixit, may not transform private property into public property without compensation . . . . This is the very kind of thing that the Taking Clause of the Fifth Amendment was meant to prevent. That Clause stands as a shield against the arbitrary use of governmental power.” (Webb’s Fabulous Pharmacies, Inc. v. Beckwith, 449 U.S. 155, 164 .) The Mississippi decision runs afoul of this Court’s authority. Br. at 3. More coming, so stay tuned. Here's the amicus brief, filed yesterday by Pacific Legal Foundation is support of the cert petition we filed last month which asks the U.S. Supreme Court to review a decision of the Mississippi Supreme Court. First, some background. In 2005, Hurricane Katrina destroyed “Toll Project No. 1,” the U.S. Highway 90 crossing of Bay St. Louis, Mississippi. The bridge had been partially built on Petitioner Bay Point's property pursuant to a highway-purpose easement granted to the State in 1952 by Bay Point’s predecessor-in-title. After the hurricane, the Mississippi Transportation Commission removed what was left of the bridge. The destruction of the bridge and the removal of the remnants discontinued the specific use authorized by the easement, and Bay Point should have immediately recovered unencumbered possession. Instead, MTC built an entirely new bridge in a different location, and converted the majority of the former highway easement into a public recreational park. Bay Point sued for inverse condemnation, and the jury determined MTC’s new uses were not highway purposes within the 1952 easement, and MTC had taken Bay Point's property. But a Mississippi statute (Miss. Code. Ann. § 65-1-123 (Rev. 2012)) compelled the jury to value the land as if it continued to be burdened by the highway-purpose easement the jury had determined MTC no longer used for its original highway purpose. The statute deems a highway-purpose easement to continue in perpetuity unless formally released by MTC, even when it no longer actually uses the easement for highway purposes. The court instructed the jury to calculate compensation as if Bay Point’s land was subject to a highway-purpose easement in both its “before” and “after” condition. The jury was also instructed to award a nominal $500, not the $16 million the property was concededly worth. Over a two-Justice dissent, the Mississippi Supreme Court affirmed. The statute, not the Just Compensation Clause, controlled the amount Bay Point received for the permanent physical occupation of its land. Bay Point Properties’ petition for a writ of certiorari raises an important issue concerning the protections provided by the Just Compensation Clause of the Fifth Amendment of the U.S. Constitution. Specifically, the petition asks whether a state legislature can lawfully enact a statute that limits the amount of money an owner of a condemned property can recover as just compensation. It cannot. The Mississippi Supreme Court’s decision is particularly objectionable—and particularly appropriate for review—because it departs from this Court’s just compensation precedents by allowing the legislature to interfere with the role of the fact-finder by enacting legislation that significantly limits the amount of money that can be awarded in a condemnation case. As set out in the petition, the jury below determined that the Mississippi Transportation Commission had taken Bay Point’s property when the Commission converted an old, disused highway easement into a public park. Petition at 4-6. Although the land was valued between $8-$16 million, a state statute (Mississippi Code § 65-1-123) capped compensation at $500—the purported value of the sliver of land that was not encumbered by the highway easement. Petition at 7-9. The trial court accordingly instructed the jury to limit its award to the amount allowed by the statute, effectively giving the Commission millions of dollars of land for a pittance. Id. at 10. There will be more, so stay tuned. The Brief in Opposition is due May 8, 2017. Another one (short) from the Kansas Supreme Court, this time a straight takings case, and not inverse condemnation. In Pener v. King, No. 114850 (Mar. 24, 2017), the court tackled several issues in a case involving KDOT's taking of land for highway project. Part of the taking required KDOT to take down the owner's fences. The owner argued that he should be separately compensated for the cost to replace the fencing. The Supreme Court held that the just comp award included the fencing, and that it wasn't a separately value taking. The "unit rule" means that property is valued as a whole, not piece by piece. The court also rejected the owner's argument that the just compensation verdict wasn't supported by the evidence (we will let you read that on your own, if interested), and then concluded by affirming the trial court's denial of an award of attorneys' fees to the property owner. The C.F.R. provisions plainly require the reimbursement of attorney fees only when a taking is abandoned or in inverse condemnation cases. Pener's argument for an expansive interpretation that universally covers "all acquisitions" would obliterate the limiting provisions in the C.F.R. Moreover, K.A.R. 36-16-1 applies to an administrative claims process, not eminent domain litigation under K.S.A. 26-501 et seq. Pener's argument is without merit. Slip op. at 13. Nor do Kansas courts have the inherent power to award fees for what the owner characterized as bad faith precondemnation conduct by KDOT. Slip op. at 15-16 ("Even if the court could have awarded Pener the sanctions he requested on some other set of facts, it could not have done so on these facts"). Here's a case you should be following which involves both public use and just comp issues, now before the Louisiana Supreme Court. The case is an appeal in an expropriation case from a quick-take of a Mississippi River docking facility downriver from New Orleans. The Port took the entire VDP facility, made no change in how the property was used, and eventually turned over operation of the facility to a "hand-picked" private operator. In St. Bernard Port, Harbor & Terminal District v. Violet Dock Port, Inc., LLC, No. 2016-CA-0096 (La. Ct. App. Dec. 14, 2016), the Louisiana Court of Appeals, over a strong dissent, rejected the owner's arguments that the Port could not take the property for economic development, the taking was for private benefit, and the argument that the Port was really taking the property in order to obtain VDP's contracts with the Navy. The court also upheld the "fair market value" standard for calculating compensation. The owner filed a writ petition with the Louisiana Supreme Court. West Virginia Dep't of Transportation v. Newton, No. 16-0325 (Mar. 7, 2017) was the second time that case had come before the West Virginia Supreme Court. As we noted here ("DOT Should Not Have Mined Privately Owned Limestone Without Owner's Permission"), the court held that the the Department of Highways should have instituted eminent domain proceedings before it started removing Ms. Newton's limestone from her land. After she prevailed in her mandamus action, WVDOH did so. As a result of the condemnation action, Newton was awarded nearly $1 million in compensation, and $250k in attorneys' fees for the mandamus and condemnation actions under the Uniform Relocation Act, which is incorporated into West Virginia law. The URA provides for fee shifting when an owner is forced to initiate a claim for compensation. WVDOH appealed, arguing that hey, we condemned Newton's property (after she won her mandamus action), so she can't get fees. Slip op. at 8 ("Maintaining that the condemnation action was filed in a timely manner, the DOH asserts that 'the inquiry into whether Ms. Newton is entitled to associate litigation costs should end with a simple review of the caption of this case,' which reads West Virginia Department of Highways v. Newton.' In other words, the DOH contends that because it ultimately filed the eminent domain proceeding, there was not inverse condemnation."). Paging Mr. Rosten! The court rejected the argument, holding that DOH didn't really intend to institute condemnation proceedings, but was forced to by her mandamus action. It didn't matter that Newton's mandamus action (which sought to compel WVDOH to institute condemnation proceedings) and not a formal inverse condemnation case. Under West Virginia law, "that is the only mechanism available to an aggrieved property owner in this state who believes his or her property has been damaged or taken without compensation." Slip op. at 11. "Thus," the court concluded, "the mandamus and eminent domain proceedings constituted an inverse condemnation action[.]" Slip op. at 12. Besides, WVDOH actedi in bad faith. Fees awarded. But (and there's almost always a "but" isn't there? ), the court sent the case back to the trial court for a recalculation of the amount of fees to be awarded. Newton retained her lawyer on a contingency fee, and the court concluded that the URA requires a "reasonable" fee, and thus the contingency arrangement "cannot be the sole basis for determining" the amount of the fee award. Slip op. at 18. Since the trial court had not undertaken the fact-driven analysis (twelve factors!) which West Virginia case law requires to determine a reasonable fee, the Supreme Court sent the case back for that determination. Fla App: Highest And Best Use Doesn't Require Owner Have More Than "Conceptual Plans"
Can there be a more "Florida" name for a municipality than "Sunny Isles Beach?" Opinion may differ of course, but we think this one may take the prize. That diversion aside, here's today's case. In City of Sunny Isles Beach v. Cavalry Corp., No. 3D15-1420 (Jan. 25, 2017), the Florida District Court of Appeal affirmed an eminent domain judgment and an award of just compensation, concluding that the trial court was within its discretion when it allowed the landowner to present evidence of "conceptual" site plans to establish the property's highest and best use. The city took property for a bridge, and "[f]or all the years since the current owner acquired title to the property and before, there has been no effort by an owner to develop the canal property." Slip op. at 3. But at trial, the owner "contended at trial, based upon conceptual site plans prepared by one of its testifying experts, that the highest and best use for valuation of the injury to the property caused by the taking is that of a private docking facility for adjoining condominiums or homes." Id. The city, however, argued this highest and best use was created for trial, and because the owner didn't take any affirmative steps to actually develop the property, the jury shouldn't have been allowed to hear of the owner's conceptual plans. The trial court disagreed, and the jury awarded the owner the precise amount sought. The court of appeal affirmed. It noted that the appraisers tried to use the comparable sales approach to valuation, but could not find comparable properties. Thus, the owner's appraiser used the discounted cash flow/development approach. The court concluded that conceptual plans are "plainly" admissible to support the appraiser's testimony. The court rejected the city's argument that this was too speculative, concluding the owner "did not seek compensation based upon what could or might be done to make the land more valuable and then solicit evidence on what it might be worth," which would have been speculation. "Rather," the court held, "the testimony  adduced [in the case before us] was based upon the actual value of the property at the time of the taking if sold for development [as a private docking facility], its highest and best use." Slip op. at 8. "We note in passing that the valuation methodology used by the Owner in this case, relying on a highest and best prospective use, even though the Owner has no plans to sell the property or use it for that use, is precisely the same strategy long employed by county appraisers in appraising property for tax assessment purposes." Slip op. at 9-10.
inversecondemnation.com: New SCOTUS Just Comp Cert Petition: Can Jury Value Property As If Burdened By Extinguished Easement? Here's the cert petition we filed today in an eminent domain case out of Mississippi. An inverse condemnation jury determined the Mississippi Transportation Commission (MTC) ceased using a highway-purpose easement granted to it in 1952 by Petitioner’s predecessor-in-title for a specific bridge, “Toll Project No. 1,” the U.S. Highway 90 crossing of Bay St. Louis. In 2005, Hurricane Katrina destroyed the bridge. MTC removed Toll Project No. 1 and built an entirely new bridge in a different location, and converted the majority of Petitioner’s land into a public recreational park. This discontinued the specific use authorized by the easement, and Petitioner should have immediately recovered unencumbered possession. The jury determined MTC’s new uses were not highway purposes within the 1952 easement, and MTC had taken Petitioner’s property. The court, however, instructed the jury to calculate compensation as if Petitioner’s land was still encumbered by the 1952 highway-purpose easement. A Mississippi statute gives MTC the absolute discretion to formally abandon highway-purpose easements. Because MTC had not done so, the jury only awarded a nominal $500, and not $16 million—the value of the unencumbered land. The Mississippi Supreme Court affirmed, conflicting with the Federal Circuit and the Court of Federal Claims. 1. Does the Just Compensation Clause prohibit a legislature from limiting how just compensation for a taking is calculated? 2. Does the Just Compensation Clause allow the jury to value the fee interest taken as if it were still encumbered by the discontinued highway easement? Will there be more? We sure hope so. Stay tuned. We've been meaning to post People ex rel. Dept' of Transportation v. Presidio Performing Arts Foundation, No. A145278 (Nov. 3, 2016) for a while (as you might be able to tell by the date of the opinion), thinking that one of our left coast colleagues more familiar with the workings of California's goodwill-in-eminent-domain rules would analyze it and tell us what to think. But so far, we haven't seen anything from them, so we'll take a short stab at it. Caltrans has been fixing up the southern approaches to the Golden Gate Bridge, and anyone who has ever driven that stretch of road knows two things: (1) Doyle Drive was hairy -- nicknamed "blood alley" because it required Steve McQueen-level driving skills just to make your way to the Bridge, and (2) it runs through the Presidio of San Francisco, the former Army post, now converted to public uses. As part of the improvements, Caltrans needed the "use, occupancy and possession" of one of the old Army buildings, by then being leased for a nonprofit dance studio. Out the studio had to go, and the building demolished. A few months later, the dance studio found another building in the Presidio to rent, although predictably, the new space rent was more expensive, less functional, had a larger security deposit required, had shared bathrooms, was away from public transportation, and is a historic property (meaning the dance studio was limited in how it could configure the interior). Oh, and the Presidio's "service fees" also increased. The compensation paid by Caltrans did not include any business goodwill, the value in a business in excess of the value of its tangible assets. (Those of you in the approximately 40 jurisdictions that don't recognize business goodwill as recoverable in eminent domain are probably saying to yourselves "no surprise there", but remember in California, it may be recoverable by statute). The Presidio asked anyway, Caltrans said no, and then instituted a declaratory action that it didn't owe business goodwill. The Presidio's appraiser testified that the dance studio had "negative cash flow" before, and the loss of its facility had made it worse, $62k worse than would otherwise be expected. He attributed the bigger losses to the taking since, in his opinion, nothing else could account for the change. Caltrans' expert, on the other hand, limited his testimony to criticism of the Presidio's expert, and predictably came to the conclusion that there was no goodwill and that the dance studio was a loser of money, and thus "there was no evidence that anyone would pay money for a company that does not expert a positive cash flow (let alone pay over $700,000 for it)." Slip op. at 8. As for the dance studio's nonprofit status -- not a factor, according to Caltrans' appraiser. The Superior Court agreed with Caltrans: "Although it was 'clear that Caltrans‘ taking caused the Foundation to suffer a loss of goodwill‖' due to the change in the Foundation‘s location, damage to the Foundation‘s reputation, and the disruption of its operations, the court concluded that the Foundation had nonetheless 'failed to meet its burden because it failed to prove the quantitative ... loss of goodwill.'" Slip op. 8. The court of appeal didn't agree, and instead concluded that in order to qualify for business goodwill, the Presidio only need prove that it "suffered some loss of the benefit" which it gained by things like its former location, reputation, quality, and the other factors set out in the goodwill statute. It didn't need to be a "quantitative" loss of goodwill. The court rejected Caltrans' argument that "the only way to determine pre-taking goodwill value is to calculate the total business value and subtract the value of tangible assets." Slip op. at 15. Ultimately the question of how much goodwill may have been lost is one for the jury, not the judge at the entitlement stage. Id. ("Accordingly, in the entitlement phase, the party seeking compensation need only show that there was some loss of the benefit that the business was enjoying before the taking due to its location, reputation, and the like, without necessarily having to quantify its precise value."). There's no required method to determine whether goodwill existed. Slip op. at 22. Here, Regus did not use the cost to create approach, and the Foundation is a nonprofit organization rather than an unprofitable for-profit business. But Aklilu illustrates that a methodology other than the profit-based one dictated by the trial court in this case may apply under appropriate circumstances. As in Aklilu, Regus determined that the Foundation had some goodwill before the taking, based on its location and reputation, and then set about determining the value of that goodwill using a method not dependent on profits, in light of the nonprofit nature of the Foundation‘s enterprise. Nor would limiting compensation to profitable businesses make sense. A business operating at a loss before a taking may not be able to demonstrate pre-taking goodwill value, but that does not mean that the benefits it enjoyed from its location and reputation have not been adversely affected by the taking. Nothing in the statute suggests compensation should be given to a business that was profitable but became less profitable, but deny compensation to a business that was unprofitable and became even more unprofitable. To do so would preclude recovery to those least likely to afford the loss of goodwill benefits due to a taking. When we previewed the 2017 ALI-CLE Eminent Domain & Land Valuation Litigation Conference while we were getting buried in the snow a couple of weeks ago, we promised there would be better weather in San Diego than much of the country was then experiencing. As you can see, we delivered. We -- and by "we" I mean the faculty, the ALI-CLE staff, and the record number of attendees who came to San Diego -- also delivered on a really great conference. See our posts on several of the presentations here, here, here, and here for a flavor. Stay tuned for details. Send your ideas for what you'd like to see at the 2018 Conference. Tell your colleagues to come if they missed out this year. The more who attend, the better this gets. We'll post more once the agenda, faculty, and registration process are ready. See y'all in Charleston. Our final day was anchored, as usual, by Pacific Legal Foundation's Jim Burling, and property rights guru and advocate Michael Berger. Jim was his usual riveting self, and Michael supplied the insight to cases which only he can. In case you are wondering, the above is the view from the dais, and no, I didn't bring a Spam calendar with me, it was a gift from a thoughtful New Jersey colleague who knows that Hawaii people love Spam. I will reserve comment on whether I love Spam, and simply say thank you for the calendar. We finished the day strong with the National Forum, where audience members took the mic and shared their cases, issues, and results with the rest of us. Here's the decision on attorneys' fees in an expropriation case awarded to the condemning authority, which our Toronto colleague Shane Rayman spoke about. It's not just a Canada thing - here's the Idaho Supreme Court case awarding the condemnor attorneys' fees. John Groen, the lawyer who will be arguing Murr v. Wisconsin on behalf of the Murr Family (should the Court ever decide to schedule oral arguments) spoke about the status of the case and the way the arguments have played out. Here's that Florida District Court of Appeals decision discussed, about project announcement and inverse condemnation. If you attended the Conference or served on the faculty, and have a web site or blog about issues other Conference participants should know about, send your URL my way, and I will post them up later this week. We should keep the conversation going. Yeah, at the ALI-CLE Eminent Domain and Land Valuation Litigation Conference now ongoing in San Diego, we talk severance damages, relocation benefits, highest and best use, pipelines, energy corridors, temporary construction easements, and blah, blah, blah. But what really matters is when our St. Louis colleague Paul Henry (the bravest man we know) presents "Everything About Eminent Domain I Need To Know I Learned From Star Trek." To a room full of the nation's best eminent domain lawyers. As one of the Planning Chairs, we told Paul that he could present this topic, but only if he did it in uniform. Well played, Captain! Leone: Hawaii Supreme Court oral arguments in "economically beneficial use" case. Our colleagues' recent Hawaii State Bar Association talk about developments in Hawaii land use law. Who decides, Part I: California Supreme Court in City of Perris -- judge decides Nollan/Dolan issues (but they may be project influences, so property owners do the happy dance). Pending issues at SCOTUS: (1) attorneys' fees under the URA; (2) Murr v. Wisconsin - the "larger parcel' in regulatory takings. Speaking of attorneys' fees: property owner's claim that trial date (and not date of complaint) was date of valuation was not reasonable. 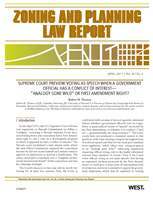 Virginia Law Review article on state constitutional property. Mike Berger's lookback on "Property, Democracy & The Constitution." Arizona Law Review: do animals have property rights? What If The Government Gives A Takings Party, But Doesn't Show Up? We love Leo Rosten's classic definition of chutzpah: "that quality enshrined in a man who, having killed his mother and father, throws himself on the mercy of the court because he is an orphan." Mr. Rosten's dictum stretches around the world -- apparently even into its remote corners such as the Northern Marianas Islands. Check out CNMI v. Lot No 281-5 R/W, No. 2013-SCC-0006 (Dec. 28, 2016), for the exemplar. In that case, the CNMI government took private property belonging to Ms. Quitugua. Not by regulating it (a favorite topic of this blog), but by "straight condemnation." That is, the CNMI exercised the power of eminent domain to build a road. Not great for the owner, but she apparently didn't object and indeed stipulated to a final judgment which granted the CNMI fee simple title, and gave her a judgment of $77,137 plus interest for just compensation. So far, so good. At that point, the CNMI apparently left the party. For twenty years. It didn't pay the judgment, despite the owner "repeatedly mov[ing] for an order in aid of judgment." Finally, decades later, the owner and the court had enough: the court issued an order in aid of judgment in which it restored fee simple title to the owner and hit the condemnor with interest. And the court also issued a writ of execution, ordering the local branches of the banks in which the CNMI government kept its cash to deliver "all monies and proceeds" to the property owner's lawyer to satisfy the judgment. It sure did. The next thing we know, the CNMI government, after doing nothing since 2005 suddenly has all sorts of constitutional concerns. The trial court's order, you see, violated the separation of powers: having taken property and not paid compensation (as required by the constitution), the government claimed that a court forcing it to pay compensation would violate the constitution. Phone call for Mr. Rosten! Courts can't order us to pay property owners, it argued. We have to have appropriated the funds and there's this statute that says we can't disburse funds unless they have first been appropriated. And if we don't, too bad. The CNMI government relied on an earlier CNMI Supreme Court decision which held that the appropriations statute was constitutional, and "although Commonwealth courts may determine the amount owed by the state in just compensation and may enter judgment against the state, there the judicial power ends." Well, it turns out that the CNMI government should have just paid the darn thing, because in CNMI v. Lot No 281-5 R/W, No. 2013-SCC-0006 (Dec. 28, 2016), the court used the opportunity to revisit its earlier decision, because it "faces a growing need to enforce landowners' constitutional right[s] to just compensation in light of the government's repeated failure to honor that right." Slip op. at 5. The property owner here was not the only one left hanging by the CNMI government, which "has 'millions of dollars' worth of outstanding land obligations to private land owners whose lands were taken for various public purposes[.]'" Id. The court rightly concluded that the just compensation requirement is self-executing, and "land owners are entitled to just compensation even when the legislature has not established a specific procedure to enforce it." Slip op. at 6. "By parity of reasoning," the court held, "absence of legislative appropriation cannot bar recovery." Slip op. at 7. Here, the Commonwealth has refused to pay Quitugua, asserting the land compensation funds are exhausted and that no other appropriated funds are available to satisfy the judgment. However, like Decker and Peterson, we find that the government may not simply neglect its outstanding land compensation judgments for lack of appropriation. If the court cannot order the government to pay the judgment, the Legislature would be able to effectively annul Quitugua’s constitutional right to just compensation via non-action. This would be an unreasonable, unjust, and unconstitutional result. Slip op. at 8. Thus, the court concluded, in the absence of the legislature adhering to its constitutional duty, the courts themselves have a duty to step in an "enforce the constitutional mandate of just compensation contained in the Takings Clause." Slip op. at 9. Yes, the CNMI Constitution also has an Appropriations Clause, which requires all revenue and appropriations bills be introduced in the CNMI House of Representatives. But the court held this was no impediment because there's a way to read the two provisions (the Takings and the Appropriations clauses) in harmony, which the court did. In light of the risk of interference with basic government functions, we agree a writ of execution is not allowed against the Commonwealth unless a statute permits otherwise. Accordingly, we vacate the Writ of Execution and remand instructing the court to use a proper method to enforce the judgment owed to Quitugua. Just what that other "proper method" might be the court didn't say, and we wouldn't hazard a guess. Send a strong letter, perhaps? Go down to the CNMI Department of Transportation with a paper bag full of cash? Vote differently in the next local election? Who knows. But despite kind of ruling against the property owner, the court fired a shot across the bow of the CNMI government: in the future if you don't pay just compensation judgments, we might get really mad: the court held that its ruling allowing seizure of bank accounts would apply to any cases in the pipeline in which the CNMI government doesn't pay promptly. Which is a strange, conditional approach to say the least. Poor Ms. Quitugua is out of luck and has to keep pursuing payment because to make the government pay -- while not unconstitutional -- would interfere with government functions (to us, it seems the CNMI government is already doing quite a good job of interfering with government functions without her help). But it would not interfere with government functions to order seizure of bank accounts for other landowners down the road. We're not sure how the passage of time would remedy the supposed defect, but there it is. Perhaps yet again this was reality intruding on the law. But we think the court's message has been sent. Stop the nonsense, CNMI government, and do your constitutional duty! So despite an anticlimactic ending, the court definitely, maybe, held the CNMI government to task for taking private property and not paying compensation. Something tells us this story isn't over quite yet. This one involved the DOT's "quick take" power, and what happens when the state first grabs property -- in this case, the right of access -- but then partially changes its mind. The DOT instituted a quick take of the owner's access rights. But after consultation with federal highway authorities, the scope of the project changed and the state informed the property owner, "There is a very real chance that we won't need any easements or access rights at all from your clients." Slip op. at 4. Sure enough, that's what happened, and the DOT informed the property owner that it wouldn't be taking an access easement, and asked the owner to stipulate to dismissal of the condemnation action. The owner refused because it believed the quick take vested title in the DOT, and thus it was entitled to have the jury determine compensation, if any. The trial court held that the state had title to the access rights by virtue of the quick take and thus the owner's right to just compensation had vested. But since the DOT had never exercised its rights to close access due to its change of plans, there was no compensation or damage owed as a matter of law. During oral argument, the State claimed that by amending its petition, the State eliminated any actual taking of JBE’s property. It also asserted that it no longer holds title to the property interests described in the declaration of taking. We disagree. The State instituted this quick-take action and, as a result, currently holds title to JBE’s property interests described in the declaration of taking. This includes JBE’s “control of access” and, in some respect, the property interest described as the slope easement. See SDCL 31-19-24 (title to the property interest described in the declaration of taking vested in the State). To conclude otherwise would allow the State to abandon the taking in violation of SDCL 31-19-35 (prohibition against abandoning condemnation proceeding). The circuit court erred when it allowed the State to abandon the condemnation proceeding. In a separate opinion, the court also concluded that the DOT could not have abandoned a quick take. Once taken, property can't be untaken. "[O]nce title vests in the State, it is not permitted to reduce or abandon the interest acquired; it is merely permitted to minimize damage to the landowner's remaining property that results from being severed from the property actually taken." Slip op. at 14. Here's the final brochure for the upcoming ALI-CLE Eminent Domain and Land Valuation Conference, set for January 26-28, 2017, in San Diego. Early registration gets you a discount (code CY009MK), as does multiple registrations from one office, so now's the time to commit to joining us for our annual gathering (the 34th Annual) of the nation's leading practitioners of eminent domain, condemnation, valuation, and takings law. There are multiple ways to register, including on line. Like in past years, the first day has three tracks: Practice, Substantive, and Condemnation 101. The latter is a one-day course for those new to the field, or as a refresher course for those with more experience. The second day, the 101 attendees will join the advanced course, and we'll have plenary sessions in the morning, followed by Practice and Substantive tracks in the p.m. As always, attendees are free to move among the tracks, so you can tailor your Conference to your individual needs. Check out the complete agenda. Together with our co-planning Chairs Joe Waldo, Jack Sperber, and Andrew Brigham, we think we've put together a pretty good program, focused on the biggest issues in our area of law, presented by a top-notch faculty. And, of course, San Diego in January is a great place to have a conference. Finally, we want to mention that it won't be all work: one of the big benefits of this Conference is the networking and social opportunities. We have sprinkled each day with the chance to get to know the faculty and other attendees, and each night has scheduled events. Now's the time to join us for what we think is the best program in our area of law. Several years ago, William & Mary Law School's Brigham-Kanner Property Rights Conference departed its usual Williamsburg, Virginia venue and held the event in Beijing. Holding the conference there allowed U.S. legal scholars and property law practitioners to share ideas and compare our ways with our PRC counterparts. The event was a great success. Now, W&M has followed up with another international venue for the Conference: the World Court (Peace Palace), in The Hague, Netherlands. The Conference kicked off last night with a reception honoring this year's Brigham-Kanner Prize winner, Peruvian economist Hernando de Soto, who opened the Conference this morning with a summary of his work and theories. One of the most intriguing is that the "Arab Spring" was a cry for property and economic rights.Count us as convinced. The Peace Palace is a mighty impressive venue to hold a conference. The outside is Wayne Manor writ large, while the inside is even more designed to reflect its status as a "temple of the law." The organizers of the Conference -- William and Mary Law School's Kelsey Rothera, Professor Lynda Butler, and Dean Dave Douglas -- have done another wonderful job with this Conference. More will follow on the panels and the substance of our discussions in subsequent posts. As for the "war" part of this post's title, a day before the Conference began, several of us paid a visit to the sites in the eastern Netherlands where in September 1944 Allied paratroopers and tankers liberated that part of the country during Operation Market-Garden, made famous by the book and movie "A Bridge Too Far." Why? Because we should remember such things, even as they are fading into history as the men who participated in the battle are dwindling. The Bridge Too Far, in Arnhem, today known as "John Frost Brug" after the commander of the British Paras who desperately tried to hold the north end of the bridge. The first battalion of the 504th Parachute Infantry Regiment of the U.S. 82nd Airborne Division crossed the Waal here at Njjimegen, paddling with their rifle butts under heavy enemy fire, in broad daylight, in canvas boats. Referred to as "Little Omaha," a British officer remarked that this was the "bravest act of the war." But they accomplished the mission, and opened the road to Arnhem despite absorbing staggering casualties. The photo does not convey the true width of the Waal. The memorial on the site where LTC Robert Cole, commander of the 3/502 PIR was killed by a German sniper. LTC Cole was awarded the Medal of Honor for leading his company's bayonet charge in Normandy, near Carentan. He was killed during Market-Garden before receiving the Medal. He was exposing himself to the sniper's fire to encourage and motivate his troopers, but paid the price that leaders must sometimes pay. "Gesneuveld voor ons" by the way, means "he died for us." The memorial was erected and is maintained by the local Dutch municipality's school. "Bridge Number 11 is ours." U.S. paratrooper Captain Thompson, upon his company's seizure of the Grave bridge (now named "Thompsonbrug"). If you ever consider doing a similar tour, you'd do well to contact Nick Kelso first. He's a Brit who lives in the Netherlands, who tailored our day-long tour and accompanied us as we drove around to each site. SCOTUS Amicus Brief: Court Can't Arbitrarily Reduce A Lawyer's "Stock In Trade"
Here's the amici brief we're filing in a case which we told you about earlier, involving the way attorneys' fees get calculated when a statute allows fee shifting. This is the afterglow of a rails-to-trails takings case, in which the property owners are entitled under the Uniform Relocation Act to attorneys' fees. We like. What we didn't like was the way the trial court arbitrarily cut the property owners' fee request, without ever explaining why. The court simply made an across-the-board percentage reduction from the "lodestar" (a reasonable hourly rate times a reasonable time per task). And the Federal Circuit affirmed. - Abraham Lincoln, country lawyer. Mr. Lincoln’s famous dictum remains the core of the practice of law. The Federal Circuit’s ruling undercuts that essential truth by subjecting the lawyer’s most precious resource—his or her services—to a standardless process that gives too much discretion to trial judges to arbitrarily determine that a lawyer’s “stock in trade” is worth less in a particular case than the market. This brief focuses on the first Question Presented, and argues that the Federal Circuit’s rejection of the lodestar method as the presumptive reasonable fee recovery—time spent by the lawyer multiplied by a reasonable rate, and the “guiding light” of fee calculations—is a recipe for capriciousness. Gisbrecht v. Barnhart, 535 U.S. 789, 801 (2002) (“The ‘lodestar’ figure has, as its name suggests, become the guiding light of our fee-shifting jurisprudence.”). An opaque process not subject to uniform and understandable standards endangers access to justice, not only for property owners seeking just compensation, but for all litigants in cases where the possibility of fee-shifting is present. This brief makes two points. First, transparent and uniform standards for the recovery of attorneys’ fees and costs in litigation fosters access to justice, particularly in cases where private citizens are forced to bring claims against an opponent unconstrained by litigation budgets. Reducing a plaintiff’s statutory recovery by district court fiat undermines the certainty that all parties rely on. This certainty is especially critical pre-litigation, when the parties and the lawyers evaluating whether to take their cases should know the ground rules to make an informed judgment. Second, we give some examples of the pattern of Government conduct in rails-to-trails cases, where it has in many instances needlessly increased the cost of litigation by its slash-and-burn approach. The case at bar must be viewed in light of the Government’s failed strategies in these other cases, because needlessly increasing the costs of litigation and then objecting to the efforts which the plaintiff undertook to win brings to mind Leo Rosten’s classic definition of chutzpah. For the district court to exercise unreviewable discretion to reduce the lodestar amount without an explanation of how or why, only adds to the injury. This case presents a good vehicle for this Court to determine that if a district court strays from the presumptive lodestar fee, it should be required to say why, with precision. The Court should grant certiorari. Damon Key colleagues Chris Leong and Loren Seehase joined us on the brief. Property Rights Lawyer Among National Law Journal's "Litigation Trailblazers"
Oct 6, 2016: HAWSCT Oral Argument In Eminent Domain Case: Do Parcels Need To Touch To Be Part Of A "Larger Parcel"
Tomorrow, Thursday, October 6, 2016, at 10:00 a.m. at Aliiolani Hale, the Hawaii Supreme Court will hear oral arguments in a case we've been following (we filed an amicus brief in the case, supporting the property owner on the first Question Presented), County of Kauai v. Hanalei River Holdings, Ltd., No. SCWC-14-0000828. The case is a taking by the County of several parcels on the north short of Kauai, but the main issue in the case -- do parcels need to physically touch in order for the jury to consider them part of a larger economic parcel -- goes well beyond this one case. The Honolulu rail project, probably the biggest eminent domain project in Hawaii's history, is underway, and the larger parcel issue could arise is more than a few cases there. What we thought was settled doctrine in Hawaii law was thrown into question by the Court of Appeals' decision in this case. The case involves three parcels on Kauai -- one of which is owned by a fellow who has been a thorn in the County's side -- which were condemned by the County for the expansion of a public beach park. The County was taking Parcels 49, 33, and 34. Sheehan owned 49, and HRH, a corporation, owned 33 and 34. Sheehan asserted his use of Parcel 49 stretched across 33, 34, and Area 51 -- a portion of another Parcel but not a separate record lot. He claimed to use Area 51 pursuant to an easement. The court of appeals held that Hawaii law requires that two parcels abut before a jury can consider them part of a larger parcel. The property owned by the condemnee was separated from the other parcel he claimed to use, and not physically connected. The condemnee claimed he used the two parcels together as a boat yard, and therefore the taking of his property damaged his use of the other. The ICA held that the owner "cannot satisfy the physical unity requirement” because the two parcels Petitioners claim to use together are separated by two others. County of Kauai v. Hanalei River Holdings, Ltd., No. CAAP-14-0000828, slip op. at 31; 2016 Haw. App. LEXIS 224, at *10 (2016). The ICA asserted the "must touch" test was established by the Hawaii Supreme Court in City and County of Honolulu v. Bonded Investment Co., Ltd., 54 Haw. 523, 511 P.2d 163 (1973), which, in the ICA's view, required "that all of the pertinent lots abut one another." Slip op. at 20. Petitioners/Defendants-Appellants Hanalei River Holdings, Ltd. (HRH) and Michael G. Sheehan (Sheehan) apply for writ of certiorari, challenging the Intermediate Court of Appeals’s (ICA) May 11, 2016 Judgment issued pursuant to its March 31, 2016 Published Opinion. The ICA affirmed the Final Judgment As to All Claims and All Parties of the Circuit Court of the Fifth Circuit (circuit court), filed on April 25, 2014, except with regard to the award of blight of summons damages. The ICA vacated the award of blight of summons damages and remanded to the circuit court for further proceedings. This case arises from the County of Kauaʻi’s (the County) condemnation of three parcels of property owned by HRH and Sheehan. The County deposited $5.89 million with the circuit court as estimated just compensation, and the circuit court issued an order of possession in favor of the County. In addition to HRH and Sheehan, Patricia Wilcox Sheehan also claimed an interest in the properties. Almost a year later, HRH and Sheehan submitted an application to withdraw the estimated just compensation. The County opposed their application arguing that it still had not been determined that HRH and Sheehan were the owners of the properties and that an updated appraisal showed that the value of the properties on the date that the condemnation action was filed was only $4.86 million. The County also moved to withdraw the $1.03 million excess from its original deposit. Subsequently, Patricia Wilcox Sheehan waived her claims, and HRH and Sheehan entered into an agreement with the County, whereby the County agreed to HRH and Sheehan’s withdrawal of $4.86 million on the condition that Sheehan indemnify the County for any failure of HRH to return excess payments. HRH and Sheehan withdrew $4.86 million, and the circuit court granted the County’s motion to withdraw the remaining $1.03 million. Prior to trial, HRH and Sheehan claimed that they had a right to severance damages for a piece of property referred to by the parties as Area 51, that was actually a part of a larger parcel owned by Patricia Wilcox Sheehan. The County opposed HRH and Sheehan’s claim and moved for partial summary judgment on the severance issue. The circuit court granted partial summary judgment in favor of the County, holding that there was no unity of title because Area 51 was owned by Patricia Wilcox Sheehan, no unity of use because Sheehan’s permits to operate a boatyard on the condemned parcels and Area 51 had been revoked, and no physical unity because Sheehan’s parcel did not abut Area 51. At the end of the jury trial, the jury determined the total value of the condemned parcels to be $5.8 million. The circuit court also awarded HRH and Sheehan blight of summons damages on the jury verdict from the date of the summons until the date that the County deposited $5.89 in estimated just compensation and from the date that the County amended its deposit to $4.86 million to final payment on the $940,000 difference between the jury verdict and the amended deposit. HRH and Sheehan appealed to the ICA, arguing that the trial court erred when it permitted the County to withdraw a portion of the estimated of just compensation, when it granted summary judgment in favor of the County on the issue of severance damages, and in its calculation of blight of summons damages. The ICA affirmed the circuit court on the first two issues. However, the ICA disagreed with the circuit court’s calculation of blight of summons damages and held that the interest should have been tolled from the date that the County made its unconditional deposit of estimated just compensation until the date that Patricia Wilcox Sheehan waived her claims and it became clear that HRH and Sheehan were entitled to receive the compensation. 1. Must two parcels physically abut in order for the jury to consider whether they are part of a larger parcel? 2. Where there are multiple properties being condemned from different owners, does statutory interest on a conditional deposit only accrue after each condemnee establishes an entitlement to its portion of the deposit? 3. Does Hawaiʻi Revised Statutes § 101-19 enable a condemnor to withdraw a portion of its estimate of just compensation after deposit with the Court and after taking possession of the property? Stay tuned. The court usually posts oral argument recordings shortly after the case is submitted. We'll bring you some post-argument thoughts as warranted. Here's the latest in a case we've been following, and which earlier resulted in a very good decision from the North Carolina Supreme Court. In Kirby v. North Carolina Dep't of Transportation, No 56PA14-2 (June 10, 2016), the N.C. Supreme Court held that the "Map Act," a statute by which the DOT designated vast swaths of property for future highway acquisition, was a taking because the act prohibited development of designated properties in the interim. 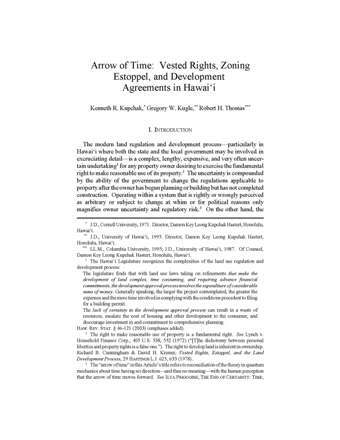 The court concluded that "[t]hese restraints, coupled with their indefinite nature, constitute a taking of plaintiffs’ elemental property rights by eminent domain." The court remanded the case for a parcel-by-parcel determination of just compensation. Here's the trial court's Order on remand, granting in part the plaintiffs' motion for partial judgment on the pleadings on inverse condemnation liability, and ordering the NCDOT to "file plats, make deposits with the required statutory interest, and, if any plaintiff rejects the NCDOT offer, scheduling Section 108 hearings if either party requests it, in order to comply with the requirements of N.C.G.S. § 136-111." Order at 7. The court demurred from determining the nature of the property interests taken ("the Court is not prepared at this stage of the proceedings to rule that the takings are in the nature of fee simple valuation; therefore, so the court will deny the Plaintiffs' motions at this time in this regard"). Order at 9-10. The court left that question for the eminent domain phase. The remainder of the Order set out the process and timeline for each party and the court to follow. More on the court's order here ("Forsyth judge to state: Start paying Winston-Salem beltway landowners"). Planning Ahead: Future Highway Corridors as Takings - with Matthew Bryant (counsel for the property owners in Kirby), and Andrew Gowder. Protecting the Owner From an Unlawful Taking: Leveraging Public Records in a Successful Defense - with Linde Hurst Webb. Counsel in the California and Nevada cases will also be at the conference. inversecondemnation.com: 2017 ALI-CLE Eminent Domain Conference Preview: "Everything About Eminent Domain I Need To Know, I Learned From Star Trek"
Before. Note the power strips on the tables. Well played, Caesar's, well played. Antrim Trucking - the Supreme Court of Canada case (won by Shane) in which the court upheld injurious affection for the business damages resulting from a highway project, even for an owner whose property was not physically expropriated. Another of Shane's cases, this one involving rural property and multiple parcels. The Texas Court of Appeals case in which a business whose property was not physically taken for a rail project was nonetheless (perhaps) entitled to inverse condemnation damages for business losses. Our thanks to Darius Dynkowski, Autumn Waters, and Kermitt Waters for planning this seminar, and for inviting us to kick it off this morning. Amici Brief: Didn't Lingle Tell Us That Due Process And Takings Are Distinct Claims? A short one from the Oregon Court of Appeals. The end result in Beaverton School Dist. 48J v. Ward, No. 441 (Sep. 14, 2016) was that the property owners in a condemnation case had their request for attorneys fees cut by more than half by the trial court, a result the Court of Appeals affirmed because the owners' arguments regarding the date of the appraisal were not objectively reasonable. Simple enough, but there are a lot of layers in this one. In a taking by the school district, the parties had a big disagreement on value. The district was in the neighborhood of $3 million, while the owners sought $9 million. The owners' valued the property on the anticipated date of trial, while the district used the date it had filed the complaint. The court granted the district's motion in limine, prohibiting the owners from introducing valuation of the property on any date other than the date of the complaint. The owners didn't have any other valuation, so that's probably why they soon accepted an offer of compromise for $600k more than the district's claimed valuation, which the district had earlier made to which the owners had not responded. The case having been settled, the trial court entered judgment, after which the owners sought $270k in attorneys fees and costs, as permitted by Oregon law. The district agreed they were entitled to fees and costs, but disputed the amount. An Oregon statute sets out a list of factors for trial courts to consider in fee requests, and one of those factors is "[t]he objective reasonableness of the claims and defenses asserted by the parties." The district asserted -- and the trial court agreed -- that the owners' argument to a trial date valuation did not qualify. Moreover, the owners ultimately settled for "the same exact amount that was previously offered and rejected." The court cut their fees down to $107k, and the owners appealed. The court of appeals affirmed, concluding that the trial court had not abused its discretion when it reduced the amount of fees and costs. First, the court relied on existing Oregon law, holding that it is very clear that the date of valuation is the date of the complaint, not the date of trial. Slip op. at 83. Second, the court rejected the owners' argument that the Fifth Amendment required the trial court to allow evidence of the value of the property on the date of trial. "We are unaware, however, of any authority, and the Wards do not point to any, applying the federal procedure in Kirby [v.Forest Industries v. United States, 567 U.S. 1 (1984)] to Oregon's condemnation statutes or Oregon's constitutional law. The statutory process and rules of procedure for a federal taking does not make reasonable defendants' arguments concerning a taking by an Oregon entity." Slip op. at 84. New Article: "Theory and Misuse of Just Compensation for Income-Producing Property in Federal Courts: A View From Above the Forest"
A new article worth your time by economist William Wade, "Theory and Misuse of Just Compensation for Income-Producing Property in Federal Courts: A View From Above the Forest," 46 Tex. Envtl L. J. 139 (2016). Bill is familiar to regular readers, as he has been a frequent guest poster, and a prolific author. This article is his latest, and focuses on how compensation should be calculated in regulatory takings cases, and contrasts how lawyers view economic losses, and how economists view the same thing (not necessarily the same way). We are grateful to the Texas Environmental Law Journal and the Environmental and Natural Resources Section of the Texas State Bar for their permission to post the article. As we noted here, this year's Brigham-Kanner Property Rights Conference honoring Hernando de Soto will to be held in The Hague, Netherlands, at the International Court of Justice on October 19-21, 2016. To push out word, the Owners' Counsel of America kindly produced a press release announcing our participation in two of the panel discussions, "Property’s Role in the Fundamental Political Structure of Nations," and "Defining and Protecting Property Rights in Intangible Assets." We mention it here only to note, as this post's headline states, this may be the only press release (ever?) to mention Hugo Grotius. Left unanswered: how to pronounce "Grotius." “I am honored to have been invited to speak at the Brigham-Kanner Conference, especially when the Conference is honoring Hernando de Soto, whose work on property rights has had such international influence,” said Thomas. "I’m also glad the Conference will be held at the International Court of Justice, because The Netherlands was the home of Hugo Grotius, whose Reformation-era writings on property rights remain influential to this day," he said. With that accomplishment crossed off our bucket list, we return you to your regular programming. Do you really need an excuse to visit Las Vegas in the interregnum between its brutally hot summers and the winter high season? Probably not. But if so, here's your opportunity. Plus, you can earn CLE credit. CLE International is putting on "Eminent Domain 2016: Current and Emerging Issues for Litigators" at Caesar's Palace, September 29-30, 2016. The Planning Chairs for the program, our colleagues Darius Dynkowski, Autumn Waters, and Kermitt Waters, have assembled a great lineup of topics and speakers, including panels on highway projects, power lines, pipeline takings, and municipal takeovers of local utilities. As if to prove the "international" part of its name, the program will also include a session on "Injurious Affection and the Canadian Approach to Damages for Partial Takings" presented by our Toronto colleague Shane Rayman. We'll kick off the conference, speaking about "Eminent Domain and Takings Law Update." We're grateful to Darius, Autumn, and Kermitt for asking us to be there. For the complete agenda go here. Full faculty list here. Register on-line here. QUESTION NO. 1.: Must two parcels physically abut in order for the jury to consider whether they are part of a larger parcel? QUESTION NO. 2: Where there are multiple properties being condemned from different owners, does statutory interest on a conditional deposit only accrue after each condemnee establishes an entitlement to its portion of the deposit? QUESTION NO. 3: Does Haw.Rev.Stat. § 101-19 enable a condemnor to withdraw a portion of its estimate of just compensation after deposit with the Court and after taking possession of the property? We filed an amici brief on Question 1, arguing that "[t]wo parcels need not abut in order for an eminent domain jury to consider whether they are components of a larger parent tract." The cert briefs are posted here. The Court of Appeals opinion under review is here. Under Hawaii's appellate process, no more briefs are filed after the court accepts certiorari review, unless the court asks for them. The court will hear oral arguments, so stay tuned. This just in, in a case we've been following closely. In City of Perris v. Stemper, No. S2133468 (Aug. 15, 2016), the California Supreme Court held that the judge, and not the jury, determines the validity of a dedication which a condemnor asserts it would impose to get the condemned property "for free" if the owner ever asked it to develop the property to its highest and best use. The case involves whether the city can avoid paying just compensation by showing that it would, in the future, exact from the owners the very same property which the city is condemning. The only way the city wouldn't require dedication of this property is if the owner continued to use it for agricultural purposes. The second issue which the court considered was the "project influence" rule, and whether the city's dedication requirement must be ignored in determining just compensation. We hold, contrary to the Court of Appeal below, that the constitutionality of a dedication requirement under Nollan and Dolan is a question for a court, not a jury. We further hold that the project effect rule generally applies, and the Porterville doctrine does not apply, when it is probable at the time a dedication requirement is put in place that the property subject to the dedication will be included in the project for which the condemnation is sought. We remand this case to the Court of Appeal with instructions to remand to the trial court for proceedings not inconsistent with this opinion. Nollan-Dolan analysis is not "factually intensive" according to the court, and the California's Constitution's takings clause only requires a jury to resolve "factually intensive questions directly related to compensation to be submitted to a jury." Slip op. at 2-3. "Because the Nollan and Dolan issues are mixed questions of law and fact in which the legal issues predominate, and because the constitutionality of a dedication requirement is analytically prior to any factual dispute as to whether the condemner would actually impose the requirement, the questions belong to the court." Id. at 3. Thus, in a condemnation action, when a government entity makes a claim under Porterville that it would have required a dedication of some or all of the property being condemned had the property been developed, courts determining just compensation should look to whether that dedication requirement was put in place before it was probable that the property would be included in a government project. Probable inclusion in a government project means that at the time the dedication requirement was put in place, (1) the government was engaging in a ―project‖ — that is, a public work the government intended to pursue — for which it intended to acquire property by purchase or condemnation, if necessary, as opposed to a contingent plan to mitigate possible development on adjacent property through dedications; and (2) it was probable the property at issue would be included in that project. Under such circumstances, the project effect rule applies and the Porterville doctrine does not. A short one from the Georgia Court of Appeals. In Summerour v. City of Marietta, No. A16A0640 (July 8, 2016), the city condemned a grocery store for a recreation center. After multiple attempts to contact the property owner and multiple offers of compensation, the city and the owner finally began the negotiation process, during which Summerour asked the city to produce a summary of its appraiser's report as required by Georgia statute. The city eventually provided the summary, and its full report. They still could not agree, and the city instituted condemnation. The court of appeals' opinion starts on a good note, reiterating that "private property rights are among 'the most basic of human rights.'" Slip op. at 7 (quoting William K. Lane III, "Your Raisins or Your Life": The Harrowing of the Takings Clause in Horne v. U.S. Department of Agriculture, 750 F.3d 1128 (9th Cir. 2014), 38 Harv. J. Law & Pub. Pol'y, 761, 761 (2015)). The court agreed with the owner that the city was required to have complied with the statute's requirement that the condemnor provide a summary of the basis for its calculation of just compensation before starting the negotiation process. Although the city eventually provided the summary, it did not do so initially. The court (correctly, in our view) read the statutory requirement strictly, and held that the statute mandates a condemnor provide the summary "before the initiation of negotiations." Here, the city only provided the summary years after initially contacting Summerour about the acquisition of his property, and after Summerour had asked the city for it. Simply informing the property owner that the property has been appraised and that the amount offered is the appraised amount, while certainly concise, fails to convey the sum and substance of the basis of the offer. Slip op. at 15. It also didn't matter that Summerour eventually got all the information the statute requires, because it should have been provided by the city at the beginning, not in the middle or at the end of the negotiations. The court also concluded that -- given its ruling that the city didn't meet its statutory obligations -- more evidence was needed to analyze Summerour's claim that the city negotiated in bad faith. The lower court had concluded that the city acted properly, but the court of appeals held that it was not clear whether that ruling was based on the city's having complied with the statute. Eminent Domain, Contingency Fees, And Fee-Shifting Statutes: A "Constellation Of Factors"
Must Read: Michael Berger On "Property, Democracy, & The Constitution"
What we are posting today is a follow-up about Mike Berger's presentation at the 2015 conference. His article -- then only in draft form -- is a critique of the theories of the 2015 Brigham-Kanner prizewinner, Harvard lawprof Joseph Singer. Recall that Berger was presented with the prize in 2014 -- the first and thus far only practitioner to receive the award -- which makes this article even more important. Berger's article is now finalized, and has been published by the Brigham-Kanner Property Rights Conference Journal: "Property, Democracy, & The Constitution," 5 Brigham-Kanner Prop. Rts. Conf. J. 45 (2016). I am troubled by Professor Singer’s view of takings law. He writes well and in a breezy style, so he is able to make it sound as though he is simply laying out a rational summary of takings law as it has been developed. But I don’t think so. I think that Professor Singer would like to wipe the slate pretty clean and start anew, establishing what he views as property “norms” that would retroactively substitute his progressive notions for traditional property law concepts. Rather than accept his thesis at face value, I suggest we deconstruct and analyze it to see how it actually comports with the property and liberty norms that a free society and the Supreme Court have already written on this constitutional slate. Those are the norms that have been deemed essential for a minimal degree of stability in a society that is governed by persuasion rather than by governmental fiat. What is essential in our system of private property, free enterprise, and constitutional protection of individuals is that people be able to know what their rights and liabilities are without years (or even decades, as too many of the regulatory takings cases illustrate) of litigation. Given a choice between making the existing system work as designed or shifting to Professor Singer’s progressive norms, I have no problem opting for the former. We recommend you read the entire article. Here's one we've been meaning to post up for a while. Not because it isn't an important decision, but because other things intervened. In State of West Virginia ex rel. West Virginia Dep't of Transportation v. Burnside, No. 15-1112 (June 13, 2016), the Supreme Court of Appeals of West Virginia held that under the statutory quick-take scheme, the condemnor has the total discretion to determine the amount of the deposit, an estimate of just compensation. In that case, the DOT took land formerly occupied by a service station, which needed some environmental clean up due to old gas and oil storage tanks buried on the land. The DOT calculated the deposit supporting the quick-take by adding up the overall value of the land, the severance damages to the remainder, and the value of the fixtures and the temporary construction easement, and then subtracting the cost of the clean up which the DOT would need to do, ending up with a net figure of $417,100. This didn't satisfy the trial judge. He believed that the deposit should not take into account the $595,000 which the DOT subtracted for environmental remediation, and thus conditioned the transfer of title and possession to the DOT on it depositing $1,012,500. Not happy with that situation, the DOT sought extraordinary appellate relief (the "Burnside" in the caption is the trial judge), and argued that the quick-take statute does not require anything more than "the applicant's ... estimate ... of the fair value of the property." And that means that the condemnor alone -- and not some judge -- has the power to make that estimate. Thus, the DOT's calculation could not be reviewed by the court. The court paid lip service to the idea that eminent domain statutes are there for the protection of property owners. See slip op. at 10 ("To be sure, the statute is designed to ensure just compensation for the property taken ..." but [and there's always a "but," isn't there? ], "it accomplishes that end by virtue of the appointment of qualified commissioners, the preparation of a particularized report based on evidence obtained through the adversary process, trial de novo before a jury, and the opportunity to appeal an adverse verdict."). Trampling upon this critical principle of eminent domain law, the majority has sanctioned the deprivation of fair market value to the landowner based upon costs uniquely and solely attendant to the State's intended usage of the condemned property." In the present case, the State is attempting to deprive the innocent landowner of more than half of the land's value. Such a result is manifestly unjust and ultimately threatens the rights of all property owners in the state. Dissent at 1. He argued that prior landowners didn't have a problem with the old storage tanks, and the West Virginia Department of Environmental Protection didn't have a problem with the two leaks which occurred (and didn't require remediation). Here's the latest in that case we told you about a couple of months ago, a published ruling in an eminent domain case from the Hawaii Intermediate Court of Appeals. We wrote that in our view, the court got it really wrong on one of the three issues in the case, whether two parcels which the condemnee alleged he used together could be considered the "larger tract" for purposes of severance damages. The property owner applied for cert (we don't call them "petitions" in Hawaii, but rather "applications for certiorari"), and the first of the three Questions Presented asks, "[m]ust two parcels physically abut in order for the jury to consider whether they are part of a larger parcel?" The County opposed the application. We thought the erroneous larger parcel analysis by the court of appeals was too important an issue to let it go, especially in a published opinion that would control future cases. So yesterday, on behalf of the Owner's Counsel of America and the National Federation of Independent Business Small Business Legal Center, we filed an amici brief in support of the property owner on the first Question Presented. Two parcels need not abut in order for an eminent domain jury to consider whether they are components of a larger parent tract. This court endorsed the national majority rule when it held that separate use, and not separate location, is the “factor [which] is controlling here on the question of whether [the three lots in that case] constituted one tract of land.” Id. at 527, 511 P.2d at 166 (“It is clear to us that the owners not only by choice and design had separated the use of Lot 65 from Lots 59 and 60 . . .”). The overwhelming weight of authority nationwide similarly rejects per se rules, and is in accord with Bonded Investment’s approach. The ICA, however, concluded that Petitioners “cannot satisfy the physical unity requirement” because the two parcels Petitioners claim to use together are separated by two others. Cnty of Kauai v. Hanalei River Holdings, Ltd., No. CAAP-14-0000828, slip op. at 31; 2016 Haw. App. LEXIS 224, at *10 (2016) (Petitioners’ Parcel 49 “is not adjacent to [Petitioners’] ‘Area 51.’”). The court established a bright-line requirement never before seen in Hawaii law, concluding that two parcels claimed by a property owner to be parts of a larger parcel must “abut one another.” Id., slip op. at 32, 2016 Haw. App. LEXIS at *10 (“we reject Sheehan’s argument that under Bonded Inv. II there is no requirement that all of the pertinent lots abut one another”). Unless this court corrects this ruling, the physical contiguity requirement adopted by the ICA is precedential, and will be applied by the lower courts to the detriment of property owners, by depriving them of their right to have a jury consider all evidence of the economic damages caused by a taking. Determination of just compensation and damages is not one-size-fits-all, but requires legal rules that accommodate the facts specific to each case. For example, in State ex rel. Symms v. Nelson Sand & Gravel, 468 P.2d 306 (Idaho 1970), the court recognized that the condemnation of a gravel pit resulted in severance damages to the owner’s gravel processing plant. After all, the owner no longer had use for a plant to process gravel, because after his pit was condemned, he no longer had any gravel to process. The ICA would have cut off that inquiry, however, merely because the processing plant was located four and a half miles away. Id. at 309. Categorical rules ignore the facts in each case, and emphasize the efficiency of summary judgment over the reality that property owners very often use separate parcels of land as a single economic unit. But if an intervening river doesn’t prohibit the jury determining that the condemnation of one parcel damaged another, then neither should being separated by Parcels 33 and 34. See Town of Jupiter v. Alexander, 747 So.2d 395 (Fla. Dist. Ct. App. 1998) (parcels separated by Loxahatchee River). If seventeen nautical miles of open ocean aren’t a categorical bar, neither are the few yards in the case at bar. See Baetjer v. United States, 143 F.2d 391, 395 (1st Cir.) (condemnation on island of Vieques caused severance damages to parcels on Puerto Rico), cert. denied, 323 U.S. 772 (1944). We are in the midst of the Honolulu rail, the largest transportation project in Hawaii’s history, in which the condemnation of private property is an essential component. The court must ensure that the governing law correctly guides the lower courts, and protects the rights of property owners who are entitled to just compensation—“the full and perfect equivalent” of the property taken. See United States v. Klamath & Moadoc Tribes, 304 U.S. 119, 123 (1938). Condemnors must also provide damages under article I, section 20 of the Hawaii Constitution, including severance damages to the remaining property when only a portion is taken. See Terr. v. Honolulu Plantation Co. 34 Haw. 859 (Terr. 1939) (severance damages mandated by Hawaii Constitution). This brief makes two points. First, the three unities are not inflexible, as the ICA concluded. There is no need for parcels to touch. The ICA’s ruling is contrary to both Bonded Investment and the overwhelming majority of other courts nationwide. Second, having been published, the ICA’s opinion is precedent. If left unreviewed by this court, the ICA’s erroneous larger parcel analysis will be applied in future eminent domain actions; if this court rejects certiorari, it should nevertheless ensure the ICA ruling has no precedential effect. For its part, the County's opposition brief doesn't really focus on the ICA's "must touch" ruling, instead arguing that the property owner couldn't show severance damages, because he didn't introduce any proof that he used the two parcels together. The ICA's emphasis on the physical unity prong of the test is clearly understandable in light of the fact that it had maps in front of it that showed Parcel 49 was physically remote from Area 51, and Petitioners had put nothing in the record showing that there was a unity of use of the two parcels. While Petitioners now argue that the ICA erred because the more modern trend is to emphasize unity of use over physical unity (e.g., App. at 5-6), in fact there was no evidence in the record as to unity of use. As already demonstrated in this response, Sheehan could not use Parcel 49 or Area 51 as a boatyard. His permits had been revoked by the Kauai Planning Commission, and that revocation was subsequently upheld by the Circuit Court of the Fifth Circuit and he ICA, and certiorari review was subsequently denied by this Court. Although the revocation was technically not final at the time of the condemnation trial because it was being appealed, there is now no question that Petitioners could not have legally used Parcel 49 and Area 51 for a boatyard, and thus there was no unity of use. Stay tuned. In certiorari proceedings, the parties usually do not file additional briefs, unless the Supreme Court asks for them. We'll let you know what happens. Please mark your calendars for Thursday - Saturday, January 26-28, 2017, to join us in San Diego, California for the 34th running of the ALI-CLE Eminent Domain and Land Valuation Litigation Conference. We're still working on the agenda, but wanted to push out announcement of the dates and venue so you can save the date and start making plans. Look for more here, including registration and hotel information. The 2016 Conference was very successful, with 3 days of excellent programming and record attendance. More on the 2016 Conference here, here, and here. We're hoping to exceed that next year, and holding the Conference in sunny San Diego in January is a good start. Stay tuned. With apologies to Professor Kanner (who regularly features a "Lowball Watch" on his blog), we offer this report of Down v. Ministry of Transportation, No. LC140038 (May 12, 2016), a trial-level property owner victory by our Toronto colleague Shane Rayman (last seen in the pages of this blog winning a great case in the Supreme Court of Canada). We've been meaning to post the decision for a while, but got caught up in other things. We probably should have waited at least another couple of days for Canada Day, but oh well. But before we get into today's case, we want to digress a bit with this bit of Canadiana. Or at least our one story about that True North strong and free, that played into every one of our preconceptions. Many years ago, while living in New York City, we got the bright idea one dark winter's night that the Quebec Winter Carnival was one of those things that we just couldn't miss. Only a few hours drive up the Northway it beckoned: snow, ice castles, Bonhomme, and poutine awaited. In case you need reminding, winters in that part of the world are cold. Like below zero cold. Much colder than our poor vehicle -- which was used to the more temperate climate of California and Hawaii -- could manage. Driving in excess of 30 mph on the said Northway resulted in the cold air shutting down (or more accurately, overpowering) the car's heating system. So we had a choice. Either drive very, very slowly to Quebec City (a 9+ hour drive even at the posted 55 mph speed limit) and stay reasonably warm, or drive normally with a car interior that was dangerously cold. We tried the hybrid, slowing down to allow the cabin to warm up, then driving very quickly until the freezing temps became unbearable. But that was no solution, and really wasn't going to get us anywhere near Quebec in a reasonable time. With daylight expiring, we opened the trunk, donned every hat, coat, and glove we had brought along, and resigned ourselves to getting to Quebec on time but ridiculously overdressed in a minus 20-degree car. It worked, and things were going just fine until we hit the US-Canada border and drove up to the Canadian Customs inspection booth. Pulling up, window down, only thing visible underneath all the winter clothing was our eyes. Customs officer was unfazed, and did not bat an eye. "Okay. Sounds like fun. Enjoy yourselves." "You know, you guys look like Eskimos, eh?" Enough of that, back to our case. Bottom line is that the Ministry's offer for a partial taking for a highway project of the owners' property (shown above, which included the residence) was $358,000, and the eventual award Shane obtained was $1,842,000 plus interest and costs. Yes, we know the exchange rate is lousy right now (or good, if you are us). But that's still more than five times the offer, no matter the currency. The balance of the decision is also worth a read, even if you never make it up that way. It details the legal standards for expropriation matters (much of which should be familiar to U.S. lawyers such as highest and best us, the before and after method, what is known as "injurious affection" (akin to severance damages plus loss of business and other property) and the like). But there's one thing in Canadian law that won't be familiar to U.S. condemnation lawyers, as Shane explained to us earlier this year: the government is required to pay the property owners' attorneys fees if the final award is 85% of the government's offer of compensation. Yes, you read that right: you don't have to beat the expropriator's offer, just get at least 85% of it. We think that last bit would be a great idea to import.